Make it easy to find information, work productively and collaborate faster. All while getting ahead with records management. Email is where work starts for most. How do you keep employees productive? 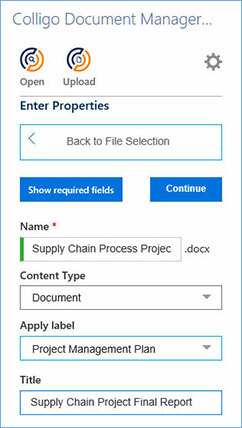 Equip employees to save emails and email attachments directly to SharePoint without leaving Outlook – and on any device. Need to make project collaboration easier for your workforce? Give users the ability to search for, save and share links to SharePoint files right from Excel, Word and PowerPoint. How can you prepare for intensifying data compliance and record management governance using your existing Microsoft tools? Enable workers to add metadata and labels as they save emails, Excel, Word or PowerPoint files—all lightning fast. Working productively shouldn’t create havoc in your SharePoint document library. 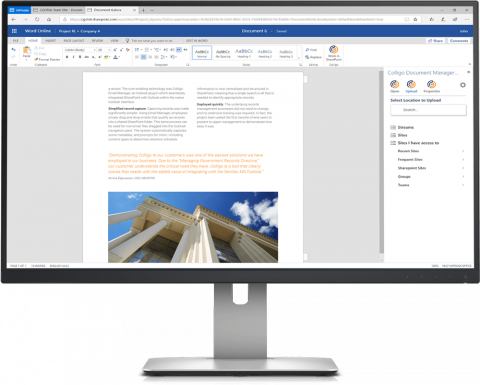 Colligo tools help keep content synced between Outlook email and all Office 365 applications and your document library. subscription without increasing costs for IT management and maintenance. Uptake by users is our focus.